Relatives of the victims of the Heli USA helicopter crash held a news conference yesterday at the Hawaii Prince Hotel. 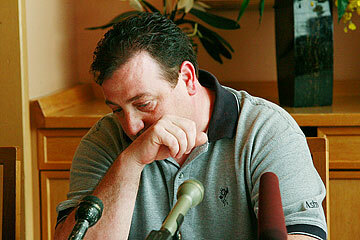 Patrick O'Donnell, brother of John O'Donnell, and his wife, Veronica, (below), wiped away tears. FAMILY and friends of four passengers who were in a helicopter that crashed on Kauai last week gathered to share their feelings yesterday during a press conference. "We just want to know what happened and prevent it from happening again," said Patrick O'Donnell, brother of one of the victims. "I know John would want that." The accident claimed the lives of pilot Joe Sulak and three passengers: John O'Donnell, Magriet Inglebrecht and Teri McCarty. David O'Donnell, son of John and Veronica O'Donnell, echoed his uncle's sentiments, saying, "No one should have to go through what we have to go through." Inglebrecht's husband, Cornelius "Neels" Scholtz; O'Donnell's wife, Veronica "Bernie" O'Donnell; and James McCarty remain at Queen's Medical Center. 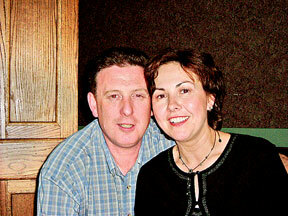 The O'Donnells were celebrating their 25th anniversary, which falls on March 27. Their vacation was a gift from their children, David and Lorraine. "They were having a fantastic time. They were just so happy with the trip. They were here, they were together," their son said. Patrick said his brother looked forward to the helicopter tour ride and talked about it for weeks. "He wanted to go on a helicopter and see Hawaii that way," he said. Family members described John O'Donnell as cautious and hard-working. He served as a superintendent for Henegan Construction Co. in New York. He worked hard to put his son and daughter through college, said his son. "He was so generous. He always stuck his neck out for everybody else," he said. David O'Donnell, right, who lost his father, John,* in last week's helicopter crash, and his uncle Patrick O'Donnell tried to keep their composure yesterday. Patrick said their father died last May and that he is worried about his mother in Ireland facing another death in the family. His sister-in-law, Veronica, is in a lot of pain after suffering multiple injuries in the crash. She is to undergo another surgery and is expected to remain at Queen's for at least another week. Inglebrecht and Scholtz were celebrating a late honeymoon after being married for 11 months. The couple's vacation was a gift from their friends. Friend Michael Benade of Phoenix said Scholtz is aware of what happened and that his wife died in the crash. "It's obviously very hard for him, and it's going to take a long time of healing. ... It's very hard. We are Christian people. We know things happen for a reason," Benade said. "We try to understand it. There will always be lots of questions." Benade said Scholtz and his wife, a native of South Africa, were adventurous and "very much in love." "Every time you saw them, they were always smiling. They were just having fun and enjoying each other's company," he said. Scholtz was to undergo surgery yesterday to the left side of his face. » David O'Donnell lost his father, John, in a March 8 helicopter crash on Kauai. A photo caption in some editions of yesterday's paper said both of his parents were killed.